There is a quiet revolution happening in Spain. Everywhere, youth, elderly and everyone in between are waking up to flavor. They are starting to demand quality, while seeking variety. This quiet revolution saw it’s first rumblings in 2005, and within a few years, has experienced rapidly building excitement throughout the Spanish countryside. 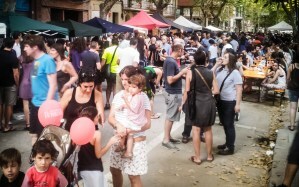 Last March, a plaza in Barcelona’s famed barrio “El Borne” was flooded with passionate Barcelonians for a massive “protest”. So crowded was the event that curious locals were turned away at the door. A similar “protest” broke out this past weekend, as Gabriella and I walked the tree covered streets of Poble Nou, and to say we were awe struck, would be an understatement. Today, I can proudly say, we are seeing a beer revolution. When I first arrived in Spain 7 years ago, there were 3 or 4 cheap lagers to choose from on a regular basis: Estrella, Mahou, San Miguel, and the occasional mass produced Belgian strong ale: Judas, Piraat and Gulden Drak. Coming from the land of hops and malt where a true revolution had been fought and won, I was at a loss. Forget finding a good Gueze or Flemish sour. Never mind a thick, viscous and dark as night stout. I would beg, plead and cajole visitors to pack a few bottle of precious hops in the form of Micro Brewed IPA’s or elegant pale ales. Trips to the UK sustained my hop levels in the interim, but I knew things would get desperate if I didn’t find another solution. Fortunately, the Spanish beer world is beginning to change. Talking with Jorge and Jorge two Catalan beer geeks who wrote the book Catálogo de Breweriana Catalana (Spanish Edition) . 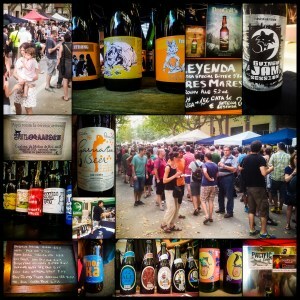 I was informed that alone in Catalunya, there are over 40 true microbrew projects going on. In all of Spain, that number might approach 100: a small step, but a vital step in helping the wine industry to grow and mature. Yes, I said wine industry. I really did. Bear with me as I try to explain. The wine industry is notoriously terrible at converting non-wine drinkers to drinking wine. Why? In my opinion, it’s largely due to the “learn first” mentality, which dictates a need to educate oneself before you join the world of wine drinking pros. Come take a class, watch a video or read a book to understand wine. Rarely is the first commandment of wine appreciation: “Thou Shalt Drink First, then go read a book if you really want to”. The wine industry wants to complicate something that doesn’t need complicating. One striking difference both Gabriella and I noticed at this past week’s festival was that when we went up and asked to taste a beer, no one started the conversation by telling us how the beer was made. Yes, if we asked for more information, they were more than willing to dive into at any level of geekdom, but their very first inclination was simply to have us taste their beer. Some occasionally asked what we thought, while others asked if we were having a good time; the overall preoccupation across the board was whether we were enjoying ourselves. A simple statement, but one that highlights the key aspect the wine market seems to forget time and time again: Fun First! 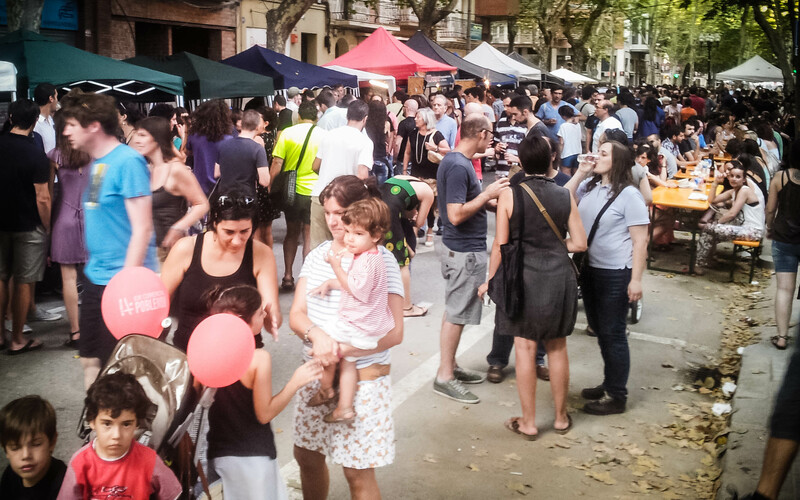 The range of people attending this weekend was diverse with everything from families of 4 to hippies smoking “herbal remedies” all along a quite side street of Poble Nou. It was fun to watch “caña” drinkers recoil in shock when sipping their first glass of IPA, only to have a smile creep across their face as they swallowed in awe. More than one beer producer expressed their excitement to see people react to the new flavors and textures. This is what excited me most; the eye-opening world of flavor. Beer producers playing with exotic hop combinations, spices and yeasts. We tasted beers from brewers who are still searching for their feet in terms of quality, and others who nailed fully developed Imperial IPA‘s. At one point, a friend passionately ran up to us and spoke of a restaurant in town hosting beer and food pairing dinners. His giddy excitement was so raw and pure, it was as if he discovered something which never had been thought of before in the history of the world. People who not 1 year ago would have been happy with their Estrella, and a soggy piles of patatas bravas, were demanding flavor in their beers while pairing them with pillowy chinese dumplings provided by one of the many new beer bar/restaurants in Barcelona, Mosquito. Witnessing this revolution proved to us that there is a segment of Spaniards want more flavor, they just want it without pretension. People who didn’t feel right in the wine world. These very same people very well might be interested in tasting new things if they felt invited to do so. I ask the wine industry here in Spain, and Portugal, don’t ignore this. These people are waking up to the world of flavor. They are the people who will one day come to you for flavors which the beer world can’t give them. The gate is open, and there is no way to close it, there is only the opportunity to embrace it. I challenge all Iberian wineries to host a beer and wine party at their winery. Build bridges. Collaborate. Craft beer is here to stay and you might as well join in the fun. Start the “craft wine” movement. Make it about fun, flavor and friends. Wine is no better than beer. Beer is no better than wine. They both are just different expressions of flavor. Ignore this revolution and you are turning your back on a whole new generation of people excited to taste the world, one liquid at a time. 1. Caña – Caña’s are typically small glasses of basic lagers served in a bar. A typical caña could cost 1€20 and be a 6oz pour. Often these are a better option to a full mug as the beer stays cold as you drink it. 2. I’ll be providing more information on the beers we tasted over the next few weeks. We just received a shipment of exciting bottles, and we can’t wait to share them with you all!